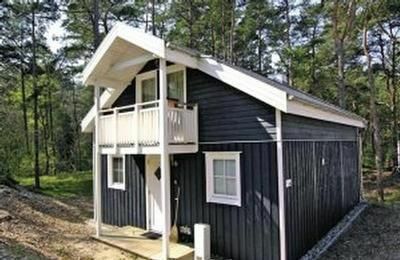 A house on the Baltic Sea! Just behind the dunes, beautifully located in the forest, there is the beach park Baabe. The house is located on a hill and is accessible via a staircase nature. In addition to the high comfort provided by this smart home, the situation is almost unique - just a few steps - and you have beautiful sandy beach under their feet. The "promenade" of Baabe is the beach road. Cozy cafes and restaurants await you. In the small shops you can browse for holiday memories. In the comfortable holiday houses, in the new beach park, you can switch off from everyday life and enjoy your fabulous vacation. Precisely because of the hot tub, the fireplace and the sauna is an idyll in any season. A walk through the Göhrener road in the village street leads into the old center of the fishing village Baabe and bulwarks, the connection of Lake Sellin and Having. Active leisure: Leave the car and take a ride on the "Orlando Furioso". With a track width of only 750 millimeters, the small train opens up the most well known resorts in the southeast of the island. EXTRAS in home espresso machine. Hairdryer. Iron. 1 P-place in the system close to the house. Other fee about 800 m away. Non smoking home. Suitable for 6 persons. - Pet: once per animal cost of 20 EUR (optional). - Tourist tax dog: per object and day costs in the amount of 0. 5 EUR (optional). - Local tax / tourist tax: per person and day costs of 2. 3 EUR (compulsory). - Water: per person and day according to consumption (compulsory). Linen (once per person, available 8. 5 EUR). Towels (one per person, available 4 EUR). Internet (per object and day, included in the price 0 EUR). Parking (per object and day, included in the price 0 EUR). Sauna (per object and day, included in the price 0 EUR).